FRANK and Walter looked on at the grass-cut pitches, a trio of players playing rugby. The sky was roaring with clouds in a blue mist. The wind was giving a slight chill, almost in resemblance of a 16-bit videogame complete with pixilation and attire. Somewhere in the midst, these two people were trying to think of a time when the national sports were at a particular peak. Somewhere in a recent modern time, Scottish Rugby had been booming with excitement fresh from a 1990’s Grand Slam victory while the Football team was regularly gearing itself towards appearing at another finals tournament, either in the European Championships or the World Cup. Apart from 1994, Scotland had there at every tournament. They had not progressed from the group stage but they had been at the tournament and that was what surely mattered? In 2005, Scotland had just finished an experiment with their foreign managerial appointments. These were tenures which were to end, awash a case of a constant rolling ball of new players coming in. The country was recovering from a lack of young talent having come through in the 1990’s to take over the old guard who had all but retired from the sport. The likes of Boyd, Gallacher, Collins and Hendry had all but gone in Football and Redpath, Townsend, Logan and Leslie in sport meant Scotland was trying to find players in their own respective domestic league to play. There could be two ways of looking at this. This wholescale way of experimentation led to an outcome of atrocious international results. Scotland’s youngsters were ploughed into the international scene at an early age. It is inevitably fair to say that because of the crisis, players such as Lee Wilkie in Football for example or Hugo Southwell in Rugby had been mired into the action from an early very age without any instance of experience around them. The consequences of this led to injuries to a majority of these particular type players from this era. The good way of looking at it is was a full scale reform of change, something that had not been seen in a long period of time. 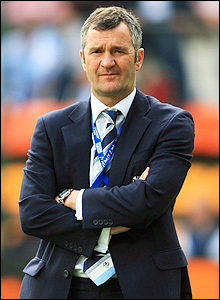 In 2005, Hadden, a Dundee born former Edinburgh coach who had led the club side to the quarter-finals of the Heineken Cup and Smith, a global success with his contribution as manager to the 9 in a row Glasgow Rangers side were almost esteemed as young grandfathers when they took over their managerial teams fresh from a state of shock. Working with largely the same crop of players as they had done under their predecessor, Hadden and Smith set out to work in a talismanic old school-grind. It was a return to a way in defensive capability because of an overall lack of technical bound players that had not quite developed into the Northern hemisphere for media exposure or consistent practice. They may not have been found yet, which might have consistently been part of the solution. Scotland’s Rugby consistently improved. A victory over France at Murrayfield thanks to Sean Lamont. There was an element too of swagger returning. Victory was achieved over England in the Calcutta Cup in 2006 and 2008. Scotland went on to finish third in a Six Nations campaign in 2006. Smith restored Scotland fortunes with a draw against Italy at Hampden. A near glorious failure was achieved with a 3-0 victory in Slovenia to finish the 2006 World Cup campaign qualification wise in third place. It was a permanent case perhaps of trying to chase something. Scotland passed on the hands to Alex McLeish in the footballing world as Scotland very narrowly almost reached Euro 2008 by a margin. In Rugby, Scotland made it out of the group stage in the 2007 World Cup but were knocked out at the first stage. What Hadden and Smith had done was steady the ship as seen now. Almost in relation to having to look to the likes of McGeechan and Stein to cultivate a revolution, turning to modern heroes with a common place traditional ground was seen as the right fortune. A blend of experience and youth was making it seen as a particular way. Hadden would leave the international Rugby set up in 2009. Scotland’s footballing spirit was largely undone by the stature of the people involved that saw Smith leave Scotland to rejoin Rangers in 2007 before Alex McLeish too was pinpointed by the English Premier League in 2009. Both sports would face a ploy in their rebuilding process. In 2015, Gordon Strachan and Scott Johnson faced another rebuilding strategy. Strachan had already begun his inheriting from Craig Levein, Johnson from Andy Robinson, head coach of a side who had lost to Samoa. Indeed the main issue was not so much about the minefield lack of talent but clearly a case of values in Levein’s case of playing without a striker once again besieged differently to the actual complexities that the nation would find itself in. What have we learned from a particular state of crisis? The aspiration of rebuilding is a good thing but really it is almost the re-evaluation learned from the process. A case of aspiring to be good again and do it a simply constructive way can no longer be the particular automatic gain. Rather merely it is a different way of doing it. If we are to stance at why both Williams and Vogts had been appointed in the first place, it was almost seen as throwing a bear into the wolves in a real context where both could be judged. In the cases of Smith and Hadden, their rebuilding work was admirable but because the main issue which had not been solved, which in this case was a lack of communication between the actual domestic league for a succession of self-interest which was ebbing away, then it is possible to see how the context has been caught in a loop which is now rebuilding itself in 2015. If we are to question the era of nostalgia which was almost perceived in a media industry, then one can assume that Scottish Sport has had to try and find its context. It is doing that right this very second.